A quality baby bedding set is essential in making your nursery warm and inviting. All Cotton Tale patterns are made using the finest quality materials and are uniquely designed to create an elegant and sophisticated nursery. Tula is a beautiful combination of bright floral and dot fabrics. 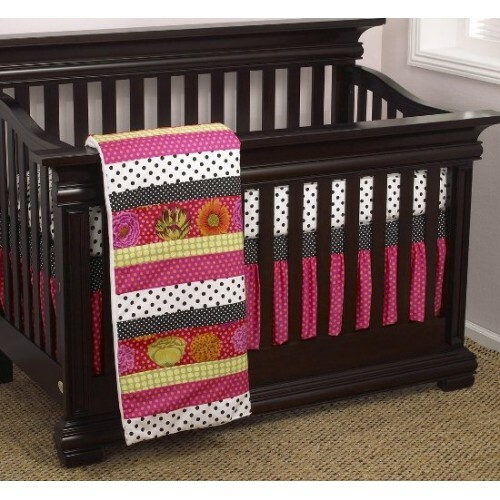 The Tula 3 pc set includes dust ruffle, fitted crib sheet, and coverlet. The sheet is white with black dot, 250 thread count, 100% cotton. The shirred dust ruffle is in hot pink with black band, with a 17" drop. Channeled quilted comforter measuring 34" x 43" in fine bright 100% cotton fabrics, soft minky backing. A fun but sophisticated crib set for baby girl. Machine wash, delicate cycle, cold water, separate. Tumble dry low.